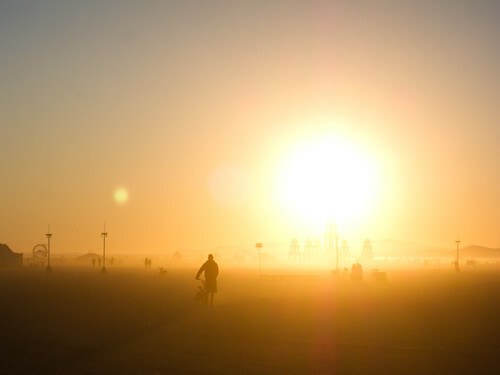 Watching the sun come up at Burning Man is a long-standing tradition – amongst those who find themselves awake to do so. Until now, and despite three consecutive previous visits to the Playa, I’ve never been one of them. Generally speaking, my hours at Burning Man tend to be quite orthodox. 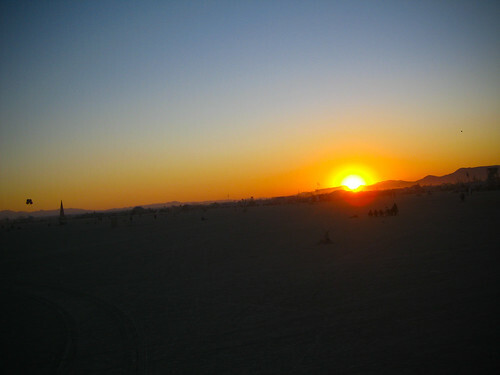 Early in the week, I get to bed (with my son) well before mid-night, and though, as the week goes on, we stay out a little later on the Playa each night, I tend to get up early all the same. For one thing, it’s because I like to to run errands, or simply run, before the temperatures turn me into a vegetable, and for another, especially this year when we camped on the “main road,” without protection to the east, it’s because I don’t have a choice: with the sun shining high and hard into our tent, I find it impossible to sleep on beyond 8am. In other words, neither my bed-time nor my getting-up time is quite conducive to witnessing a 6am sunrise on the playa – and nor, for that matter, is my lack of bicycle to get me sufficiently far away from the City and out into the desert in time. But this year, as I looked through the schedule of 1300 different DJ sets, I saw that Coldcut would be seeing in the Sunday sunrise, the most hallowed of them all given that it follows the peak-of-the-week burning-of-the-man. I decided to go for it. Campbell and I got to watch the man burn courtesy of an Art Vehicle that kindly came by to cater to us bike-less Kidsvillians and were back at our tents at a sensible hour. He was tired from wandering the Playa on his own for so long the previous night, and I was tired, period. But I set my alarm for 5am anyway, and when it went off, jumped to my feet and was quickly (and, I hope quietly) out of the tent, having been through the short sharp Sunday morning pre-dawn shock several times before to run Marathons and such like. The mile and a half walk to the Fractal Nation sound system, out at the 2 O’Clock axis and then up several streets, took me past many a now-weaning dance tent, and a multitude of keenly attended burn barrels. (They say the coldest hour is just before the dawn…) Curiously, once I got to Fractal Nation, or at least once the dark sky began to emit a shade of blue-ish purple from over the eastern mountains, I found that I wasn’t interested in Coldcut, great DJs though they are, but only in enjoying the sunrise by myself. When I say “by myself,” naturally I mean I shared it with hundreds and hundreds of others; as the moment got closer, any number and manner of vehicles could be seen heading out to this far-flung corner of the City. Other dancers peeled away from the all-night tents, too, some in a better state of repair than others. What struck at this point – not that I didn’t know it already, but it felt so much more pronounced at this moment – was the enormous variety of different cultures at Burning Man: from ravers to punks, hippies to dreads, bunnies to gays. There are groups who wear trenchcoats and top hats and heavy duty body jewelry; there are others come out for the dawn in three-piece white suits. And at this moment, there were also any number of relatively “normal” people, out on their bikes, or on their feet, cuddling up to each other in the pre-dawn cold At Burning Man, it really has to be reinforced, everyone is welcome, and welcome to do their own thing. And that most certainly includes the woman wearing eagle wings who ran-danced her way through the Fractal Nation dance-floor and beyond, wearing a deliberately big greet-the-new-day smile on her face, right as the music deliberately dimmed and the first rays rose from beyond the distant mountains. Now, the rising of the sun is not that big a deal when you’re in your house, or perhaps in your car, and you don’t really get to stop and observe it clearly because you’re going about your business; or perhaps because it takes place behind clouds, or through the trees, or comes up over a city full of buildings. But when you’re out in the desert, and surrounded by so much spiritual stimulation, and the sky is clear, and the Man is still smouldering, and the music has been blaring all night, and you haven’t had much sleep all week, and you know you’ll be going home soon, and that tonight the Temple will burn in memory of those who already saw their last sunrise on this earth… well, let’s just say it takes on a different meaning. Let’s also say that it doesn’t seem like the same sun we see poking its way through the morning fog, haze, and tree cover in our east coast Catskills mountain abode. This one lifts itself out from the horizon big and bold, as bright red as it’s ever going to get, and within mere minutes of doing so, it’s up and over the mountains and rising high into the sky already, its rays so damn powerful and life-affirming it’s almost as if they’re visible. Until you saw this picture, you might have thought my writing was the result of daytime sun-stroke. Now you know different. Yes, this is what it looks like – and this was taken the same Sunday morning that I witnessed, as Burners drifted back to camp from their Saturday night festivities. It beats the sunrise in South London in January, that’s for damn sure. The effect of the Sunday dawn at Burning Man is rendered that much more potent by the number of people paying rapt attention, many of whom set off across the desert in its general direction as if hoping to bump into it on the way. (They will encounter the trash fence in less than a mile.) As the sky lights up in the west as well, I hear the music at Fractal Nation pick back up and return to join the throng. It’s grown ten-fold in the hour I’ve been away; whether these people have been up all night or, like me, set their watches for the sun rise, they know that this is the hot dance ticket – and the best time of day for dancing, anyway. And so, it’s a long, slow walk, made none the easier by the fact that most of the street-names have been ripped off from their intersections (in what I am certain is a deliberate attempt to truly unhinge all-night partiers from their last tentative grips of reality), but fortunately, Kidsville is sufficiently central and I know that if I keep my eyes on the flags at the Centre Camp café, I can’t go too wrong. I make it back to camp, alive and just about kicking, and down a full bottle of water in one go. My teenage son is still asleep in the tent; how he does it in this heat I have no idea. I join my friends at the shade structure next door, fall into a reclining deck chair, and think about getting more sleep myself. But my mind is too busy turning over the events of the previous week, it’s too joyously overloaded, and rendered all the better by getting up to experience the Sunday sunrise. I realize now why so many people make such a point of this, and I vow to do so again next year – and perhaps this time, joining the peaceful people at the Temple. One of these years, I know, I’ll be saying goodbye to somebody there. 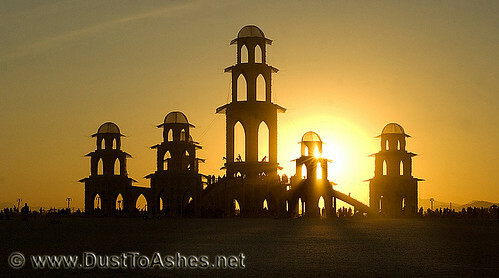 In the meantime, there’s still 24 hours ahead of us before we say goodbye to Burning Man for the year. I bounce off the sofa in search of fresh coffee. The sun is shining, and in the distance I swear I can hear someone singing “It’s a fine day.” It might just be me. Every dawn, dozens, perhaps even hundreds of people watch the sun come up from the Temple. From this image, you can understand why. Thanks to Dust to Ashes for sharing; click on the image to see more like it in Flickr.